Whether you’re planning a gala wedding for 250 guests at a hotel, a birthday party for 50 teens in your back yard, an intimate 25th anniversary dinner for close friends & family or a lavish New Year’s Eve celebration, planning is a must for a successful event. At Gersky’s, our goal is for your event to be memorable from the moment your guests walk through the doors to years later. Having a Vision and following our 5 steps: budgeting; date, time & location; guest list and invitations; food & beverages; and entertainment, will guarantee that your party is a success. At your home or at a catering/event space, hotel, your synagogue or church, swim club, or possibly a local public park? Do you envision your wedding as an adults only affair or will young children be invited & welcomed? Will you hire entertainment for your son’s Bar Mitzvah or birthday party or will he and his friends provide the music? Will you do all the work yourself, ask friends and/or family to help or hire an event planner like Gersky’s to help? If you are doing all the planning, don’t overlook the first and most important part – A VISION about what you want it to be, look like and what you want your guests to remember about it in the years to come. Plan a budget and stick to it! Being realistic about what the party you envision will cost and keeping within the budget is critical. Plan ahead on where you’re going to splurge and where you can save. Are you a DIY enthusiast or crafter? If so, making the invitations, party favors, memory boards, etc for the event will save money so you can splurge on a more upscale event space or a cappuccino cart during dessert. Can you accommodate your friends for a lavish sit-down dinner in your home to celebrate your anniversary? If so, save by doing this and splurge on catering so you can really enjoy your guests. Don’t let your budget balloon beyond more than 5% of your original plan. If you see this happening, revisit your vision and make needed adjustments. One of the most discouraging, but avoidable, dilemmas is failure to check with important family & friends in advance about the date you’ve chosen. A graduation party can be spoiled by choosing the same date that one of your daughter’s best friends is having her party. Are you planning an outdoor event? Rain or intense summer sun will put a damper on the best outside party if a tent hasn’t been reserved far enough in advance. Disappointments like these can be avoided by inquiring with multiple venues, talking to friends and relatives at least two months in advance (8 to 12 months for weddings if possible), and being flexible with your date, location and venue. Make a guest list that matches your vision and stick to it even if your grandmother insists that your aunt Sue’s children be invited. Keep in mind that only about 80% of invitees will typically attend a party they’ve been invited to. If you’re happy with 50 guests at your parent’s 25th wedding anniversary party, though the venue holds 100 and you invited 75, don’t let this bother you. If you want to be assured of a larger affair, expand your list. In all probability, at least 10-15 invitees will decline the invitation, with a few more as the date draws near. Formal, mailed invitations as well as Save-the Date cards are usually preferred for weddings, but nothing should stop you from making these yourself to stay within budget. Invitations to guests by e-mail, text and phone are all acceptable for most other events & should include a dress code and party theme if appropriate. In your vision, do you & your family enjoy cooking for your friends and relatives or is this to be a catered event at a venue or at home? Have you used a favorite food purveyor, like Gersky’s, in the past that you want to hire again? If so, check far enough in advance if they are available on your date and/or if they are approved for the location. If budget friendly is the goal for the anniversary party, wedding or holiday gathering, make some of the appetizers, main course or desserts yourself (everyone has a specialty) and cater or purchase the rest. A host should never be toiling in the kitchen when guests arrive, so think about serving cold dishes and/or buy prepared crowd pleasers like sub trays or chicken wings and fingers. 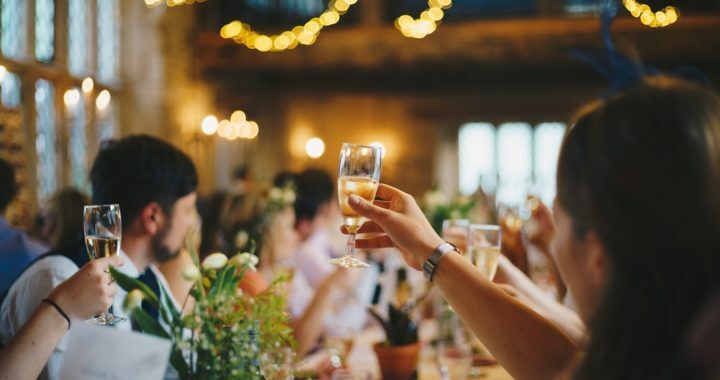 When you envision your wedding or anniversary party, will you be having an open bar, signature cocktails, an alcohol-free event or a BYO party? This is an important decision because it will affect your budget. Whether your entertainment is a live band, DJ, magician, clown, farm animals, or a photo booth, be sure it fits your vision and is within your budget. Get written receipts and read contracts before you commit. Can you get your deposit back if the bouncy house needs to be cancelled because of rain? Will you have activities for young children attending your wedding reception such as face-painting, a clown or a table with games, coloring books, crayons, puzzles, etc? If your event is at a venue or in a public space rather than at home, be sure to check with the manager so she knows what you’re planning and if it’s acceptable. Music is essential at a party, but if your budget doesn’t permit a live band or DJ, make a playlist from your own music collection or tune into an Internet radio service such as Pandora or Spotify on your phone or tablet. Choose a few stations to suit the occasion and that will appeal to everyone’s taste. Party planning can seem overwhelming at first but if you want to do it yourself, have a vision then make a plan to accomplish your vision including the budget; the date, time & location; the venue; the guest list & invitations; the food & beverages; and the entertainment. You’ll be more relaxed and enjoy yourself on the big day if you do and that’s really the point, isn’t it? If you haven’t already, sign up for our newsletter on the gerskys.com home page and receive our Party Planning Checklist! Posted in Entertaining Tips, Where to Begin.